Saffron and seafood are the perfect marriage, a partnership that is commemorated in the traditional fish soups of the Mediterranean, including the mighty bouillabaisse. In this creamy American chowder (the name comes from chaudière, the pot used by French seamen who trawled out of Montreal and Quebec), shellfish and prawns are combined with sweetcorn and cooked in a fish broth. Heat the olive oil in a large saucepan over a medium heat, add the bacon and leek and fry gently for 10 minutes, without browning. Meanwhile, soak the saffron threads in a splash of boiling water for 10 minutes. Then crush with the back of a spoon. Add the fish stock, bay leaves, allspice and the saffron with its soaking water to the bacon and leeks, and bring to the boil. Add the potatoes, return to the boil and simmer for 10-15 minutes, until the potato is soft but still keeps its shape. Tap the mussels sharply and discard any that do not close. Add the sweetcorn and the mussels to the chowder and cook until the mussel shells open (about 3 minutes). Discard any that do not open. Add the prawns, return the chowder just to the boil, stir in the cream then remove from the heat. Adjust the seasoning. Ladle into deep bowls, sprinkle with parsley and serve with bread rolls. 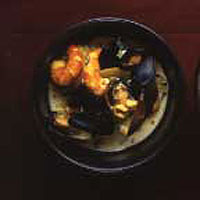 This recipe was first published in September 2004.